The RDS-220 hydrogen bomb, also known as the Tsar Bomba, is the biggest and most powerful thermo nuclear bomb ever made. It was exploded by the Soviet Union on 30 October 1961 over Novaya Zemlya Island in the Russian Arctic Sea. The hydrogen bomb was air dropped by a Tu-95 bomber using huge fall-retardation parachute. The detonation occurred 4km above the ground producing a yield of 50Mt, which is believed to be equivalent to the explosive power from the simultaneous detonation of 3,800 Hiroshima bombs. 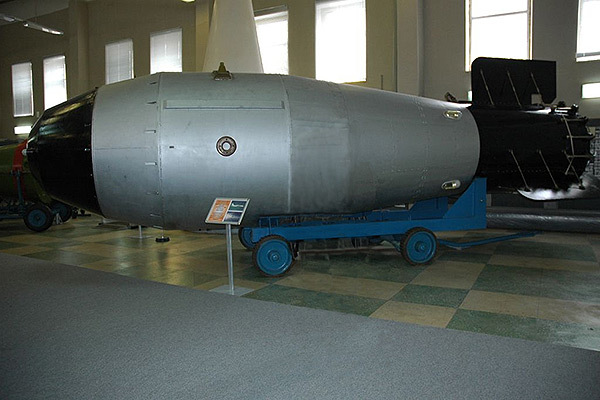 Tsar Bomba contained three stages, unlike normal thermonuclear weapons that explode in just two stages. While the addition of third stage increased the explosive power of the thermonuclear, the bomb’s actual yield of 100Mt was reduced by 50% to limit radioactive dust. The B41 or Mk-41 with a yield of 25Mt is the most powerful thermonuclear weapon ever fielded by the United States. About 500 bombs were produced between 1960 and 1962, remaining in service, until July 1976. The development of Mk-41 commenced in 1955 to fulfil the US Air Force’s requirements for a Class B (10,000lb), high yield thermonuclear weapon. The prototypes were test fired during Operation Hardtack Phase I in 1958. The three-stage thermonuclear weapon was primarily boosted by deuterium-tritium and believed to have used Lithium-6 (95% enrichment) deuteride fuel for fusion stages. Two versions were produced, a “clean” version (lead encased third stage) and “dirty” (uranium encased) version, both were air dropped by attaching with two parachutes for delayed detonation. The TX-21 “Shrimp” thermonuclear weapon was exploded by the US on 1 March 1954 during its biggest ever nuclear weapon test, Castle Bravo, at Bikini Atoll in the Marshall Islands. The detonation yielded an explosion force of 14.8Mt. The TX-21 was also a scaled down variant of the TX-17 thermonuclear weapon first tested during the Castle Romeo exercise in 1954, and used lithium deuteride fusion fuel. The fuel for this two-stage hydrogen bomb consisted of 37% to 40% enriched Lithium-6 deuteride enclosed in a natural uranium tamper. The TX-21 was exploded 7ft above the surface and radioactive fallout spread over more than 11,000km2. The explosion dispersed radioactive substance over some parts of Asia, Australia, the US and Europe. The Mk-17, weighing over 18t, was the heaviest thermonuclear nuclear weapon ever made by the US. It was also the first operational hydrogen bomb of the US Air Force. The Mk-17 had an estimated yield of 10Mt to 15Mt. About 200 Mk-17 bombs were produced by 1955 and the bomb was retired from the USAF service in 1957. The large and heavy bomb had a loaded weight of 41,400lb. The bomb was air dropped by B-36 bombers using a single 64ft parachute to delay the fall so that the aircraft had additional time to escape from the detonation impact. The Mk-24 thermonuclear bomb, which was one of the most powerful nuclear weapons built by the US, was designed based on the Yankee test device. Yankee was one of the six detonations in the Castle nuclear detonation test series. The Mk-24 was produced in a number of configurations with explosive force ranging from 10Mt to 15Mt. The MK-24 was similar in appearance to the Mk-17 thermonuclear bomb. The US produced 105 Mk-24s between 1954 and 1955. The weapon was eventually retired from the USAF service in 1956. The deployed prototype of the Mk-24, designated as EC-24, was tested on 5 May 1954 during the Yankee test generating a yield of 13.5Mt. The Ivy Mike hydrogen bomb was based on the thermonuclear device demonstrated during the Test George conducted by the US on 9 May 1951 as part of Operation Greenhouse series of four nuclear device detonation tests. The Ivy Mike test yielded an explosion of 10.4Mt, 700 times the explosive force of the weapon dropped on Hiroshima. The device had a length of 6m and diameter of 2m and weighed 82t. It was not a deliverable weapon and was only used to validate the concepts of nuclear weapons. A simplified and lighter variant, known as the EC-16, was developed later. The nuclear weapon employed an implosion device similar to that of “Fat Man” bomb, which exploded over Nagasaki, to activate the cooled liquid deuterium. The Mk-36 was a two-stage thermonuclear bomb used a multi-stage fusion to generate explosive force of up to 10Mt. Two versions, Y1 and Y2, were produced. The Mk-36 was an upgraded variant of the Mark 21 which itself was a weaponised derivative of the “Shrimp” device. The US produced 940 Mk-36 bombs during 1956-1958 and converted 275 bombs into Mk-21s. The Mk-36 was designed to be airdropped using two parachutes. All Mk36 nuclear bombs were retired by 1962 and replaced by B41 nuclear bombs. The B53/Mk-53 was the oldest and one of the highest yield nuclear bombs in the US inventory. The weapon had an estimated yield of 9Mt and was retired from the USAF service in 1997. It was deployed aboard B-47, B-52 and B-58 bombers. The B53 nuclear bomb was a two-stage implosion weapon using highly enriched uranium and 95% enriched Lithium-6 deuteride fusion fuel. It was produced in two versions including B53-Y1 and B53-Y2. The nuclear weapon was designed to be air dropped using five parachutes, while the free fall delivery was also possible by jettisoning the “can” with the parachutes. The Mk-16 hydrogen bomb was the only liquid fuel thermonuclear weapon ever built by the US. It was based on the Ivy Mike hydrogen bomb and had an estimated yield of up to 7MT. The Mk-16 was built in Experimental/Emergency Capability (EC) variants and initially completed a drop test in December 1953. The weapon was deployed in EC version designated as EC-16. The TX-16 bomb measured 61.4in in diameter and 296.7in in length. The weapon retired from the service by April 1954 as it was replaced by solid-fuelled thermonuclear weapons such as TX-14 and Mk-17. The Mk-14, which was the first fielded solid-fuel thermonuclear weapon of the US, yielded 6.9Mt when it was exploded during the Castle Union nuclear test in April 1954. The bomb used a non-radioactive isotope of lithium (Li-6) instead of tritium. The procurement for the TX-14 programme was approved in September 1952. The TX-14s in emergency-capability configuration were inducted into service in February 1954. The Mk-14s retired in October 1954 and some of them were recycled into the Mk-17 weapons by September 1956. B-36 and B-47 bombers were used to carry TX-14s, and the rate of fall was decelerated by employing the parachute drop method.